Soft, chewy, and filled with cocoa flavor, these cookies are great hot out of the oven and stay great for at least a week after baking. 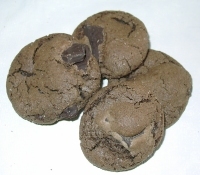 Try what one taste tester called "the ultimate in chocolate cookies" today! Mmmmmm. To quote one taste tester "These cookies should be illegal in 50 states." Yet another, a real chocolate connoisseur called them the "best darn cookies I have ever eaten". Who are we to argue? They are rich with cocoa flavor and big chunks of bittersweet chocolate. The cookies are soft, and stay soft for days, making them perfect for cookie jars and picnics. Dutch processed cocoa results in a richer, more intensely flavored cookie, but regular old baking cocoa also produces an excellent cookie. Break the chocolate into 1/2 inch - 1 inch chunks and set aside. Beat the butter with the sugar and brown sugar until smooth and creamy in a medium bowl. Beat in the eggs and vanilla until smooth. Sift in the flour, cocoa, baking soda, and salt. Stir until smooth. Add the chocolate chunks. Cover and refrigerate for 2-3 hours. Preheat the oven to 375 degrees. Place the additional sugar on a small plate or bowl. Take about a tablespoon of the dough and roll the cookies into a small ball. Roll in the sugar and place on ungreased cookie sheets about 1 inch apart. Bake for 9-11 minutes, or until the cookie tops and sides are liberally cracked. Remove from the oven and let the cookies sit for five minutes to firm up. If you move them too soon they will be too soft and will break. Transfer to wire racks and cool to room temperature. Store in an airtight container. Note : You can make these cookies as drop cookies and just sprinkle the sugar over them before baking. They taste the same, but are not quite as pretty as you can see from the photo below. If you make them as drop cookies, you can skip refrigerating the dough.